On Wednesday, October 8th, I'll be a guest on These Days on KPBS radio at 10 a.m. Tom Fudge hosts the show and I'll be on with Victor Jimenez, executive chef/owner of Cowboy Star restaurant and butcher shop in the East Village to talk about beef. 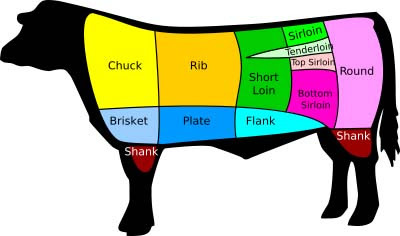 We'll cover everything from how cattle are fed (grass vs. grain) and different cuts of meat to the best ways to prepare them, favorite recipes and the best places to find great beef--restaurants, butcher shops and markets. Tune in at 89.5 fm at 10 a.m. Pacific or go to the KPBS website to listen or podcast the show.